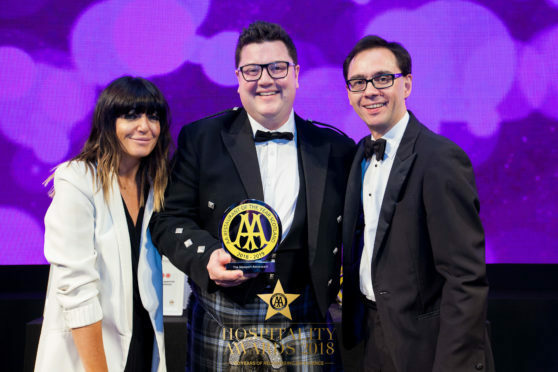 Jamie Scott of The Newport collects his award from Claudia Winkleman and Simon Numphud, managing director of AA Hotel & Hospitality Services. Fife hotels and restaurants scored a hat-trick of wins in one of the hospitality sector’s most prestigious awards ceremonies. The AA Hospitality Awards, held in the Grosvenor House in London, saw The Newport Restaurant named Scotland Restaurant of the Year. The Old Course Hotel was named Scotland Hotel of the Year, while The Fairmont St Andrews was named Eco Hotel of the year for its environmental initiatives, which include recycling soap and introducing two beehives to the hotel grounds. The awards were presented by Strictly Come Dancing host Claudia Winkleman. Masterchef: The Professionals winner Jamie Scott, chef patron at The Newport Restaurant said: “This is a massive achievement for myself, my wife and our team. “It is everything we could have hoped for and really confirmed for us that everyone’s hard work and determination in such a young business is paying off. Inspectors also praised The Old Course Hotel, saying: “The hotel has continued to develop under the ownership of Kohler who have made major investment into refurbishing the bedrooms and creating a new spa. The Eco Award presented to The Fairmont Hotel recognises efforts to reduce the environmental impact of hotels. Inspectors said: “Investment in the hotel through both a new building management system and new combined heat and power, have led to significant reductions in electricity, gas and water. “The hotel recycles approximately 250kg of bathroom soaps and hygiene products per month that are donated to humanitarian organisations through the ‘Clean the World’ initiative.